Petrol price has been cut by Re 1 a litre, but the first reduction in diesel rates in over five years will have to wait till completion of assembly polls. State-owned oil firms, which cut petrol price by 54 paisa on 1st October, reduced rates by another Re 1 per litre, excluding local sales tax or VAT, with effect from midnight tonight, Indian Oil Corp (IOC) announced in New Delhi. The price revision was due Wednesday evening but was announced on Tuesday ahead of polling in Maharashtra and Haryana. After accounting for the incidence of local sales tax, petrol rate in Delhi was reduced by Rs 1.21 a litre to Rs 66.65 per litre, according to Indian Oil Corp (IOC), the nation’s largest fuel retailer. 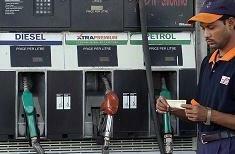 In Mumbai, petrol price was cut from Rs 75.73 to Rs 74.46 per litre. “Since last price change, international petrol prices have continued to show a downward trend. However, the INR-USD exchange rate has depreciated. Despite INR-USD depreciation, the fall in international oil prices warrant a decrease in selling price of petrol in the domestic market. “Thus a downward revision in selling price of petrol by Re 1.00 /litre (excluding state levies) is being effected from midnight of 14th/15th Oct’14. With this price revision, Retail Selling Price at Delhi shall decrease by Rs 1.21/litre (including VAT), with corresponding decrease in other states,” IOC said. Diesel, the nation’s most consumed fuel that has a direct bearing on prices of essential commodities as it is the preferred fuel for the transport sector, is regulated or controlled by the government. The fall in international oil rates last month led to situation where state-owned oil firms started making profit on diesel sales, the first time in history. However, the benefit could not be passed on to consumers as the model code of conduct had come into place with the announcement of elections to Maharashtra and Haryana assemblies. Since reduction in rates would have been a new policy, a revision was deferred.